KAMPALA – The High Court has ordered dfcu Bank to pay a former Crane Bank employee damages of Shs 82 million for unlawful deductions to his account and in effect banned city law firms MMAKS Advocates and Bowman’s of messers Kanyererezi Masembe and David Mpanga from representing any entity against the defunct Crane Bank. Crane Bank, of city businessman Sudhir Ruparelia, was closed by Bank of Uganda in October 2016 and later controversially sold to dfcu Bank in January 2017, with the matter now before several courts and a subject of inquiry by parliament. In his ruling on Tuesday Justice David Wangutusi ordered dfcu Bank to pay Mr Shakil Pathan Ismail Shs 62 million, general damages of Shs 20 million and costs of the suit plus an interest rate of 21 percent of the total sum from April 2016 to-date. 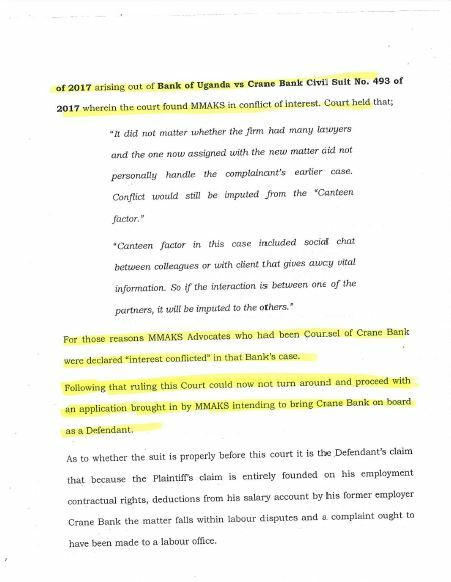 Mr Shakil complained that the former Crane Bank management had blocked and deducted his salary to the tune of Shs 62 million without reason. 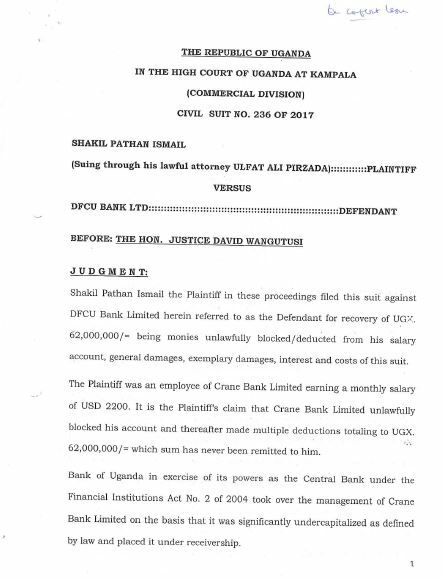 In his ruling, Justice Wangututsi has ruled that dfcu Bank can suffer all previous liabilities inherited from Crane Bank- provided the victims of these liabilities, were never privy to the purchase of Crane Bank Assets & Liabilities. In rejecting an application by dfcu Bank filed by city law firm MAKKS Advocates seeking to add Crane Bank as a defendant, Justice Wangutusi indicated that owing to an earlier ruling, the firm and that of city lawyer David Mpanga cannot represent any entity in any case against Crane Bank because an earlier court inquiry found them “conflicted”. In his ruling delivered on December 21, 2017, the head of the commercial court division, Justice David Kutosi Wangutusi stated that David Mpanga of A.F. Mpanga Advocates and Timothy Masembe of MMAKS Advocates acted in violation of the Advocates (Professional Conduct) regulations. 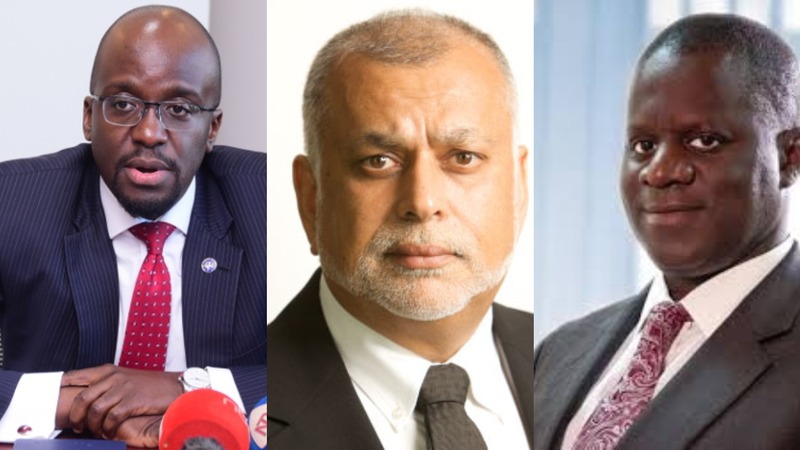 BoU sued Mr Ssdhir and Meera on behalf of Crane Bank which is under receivership of the central bank in the unprecedented case involving purported sh397b fraud orchestrated in a commercial bank. Although BoU lawyers claimed that they represented Crane Bank and not Sudhir as a person, Justice Wangutusi said they are potential witnesses in the main suit. “There was a possibility of disclosure of information by Sudhir to the said lawyers since they participated in negotiations with him over company matters,” the judge noted. The central bank in October 2016 closed Crane Bank, previously one of the best performing banks before controversially selling it dfcu Bank in January 2017 for a paltry Shs 200 billion. 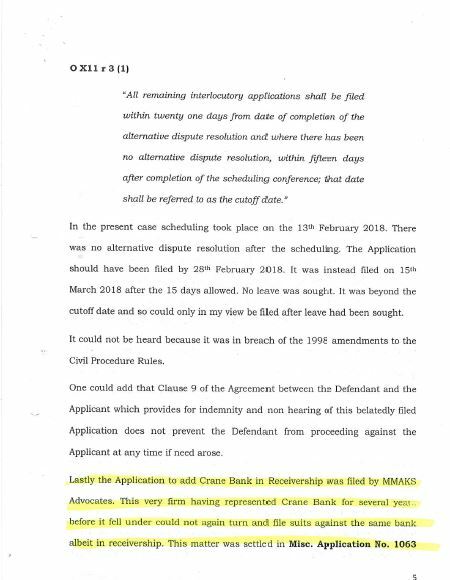 The central bank then sought to take Mr Sudhir and other directors to court, hiring the services of Mr Masembe and Mr Mpanga, but the city businessman protested saying that the two lawyers had represented Crane Bank and had conflict of interest. The Commercial court later stripped them naked, ruling them out of order. Mr Masembe was last week a subject of controversy after he was filmed meeting the former Executive Director for Supervision Justine Bagyenda inside the bank premises on a Sunday with the video clipped played before the Parliamentary Committee. BoU officials have faced several questions over the controversial sale of Crane Bank to dfcu Bank, with evidence tabled before the committee pinning the former Executive Director for Supervision Justine Bagyenda for waiving the Financial Intelligence Authority (FIA) rules for dfcu Bank to evade loan regulations. The evidence before the MPs, indicates that BoU officials wrote off Crane Bank Ltd loans amounting to Shs600b through unclear circumstances, and Ms Bagyenda’s January 25, 2017 letter to dfcu Bank Managing Director Juma Kisaame, giving the bank several waivers to evade the rules has been handed to the MPs as the sale of Crane Bank Ltd took Centre stage in the inquiry.